Founded in 1943 in Älmhult, Sweden, IKEA is the world's largest furniture retailer. In the 2016 fiscal year, the company generated a global revenue which exceeded 35 billion Euros. One of the key competitive advantages IKEA has is its extensive knowledge about the customers. The company understands the purchasing factors that influence customers to buy and implements the best practices to induce that decision and, as a result, has become one of the most loved companies worldwide. IKEA offers low prices and a huge range of products. Designers constantly introduce new design products that look stylish in the eyes of customers. All the products are designed so they are easy to transport and assemble. Moreover, the company offers the widest product range and positive shopping experience. All of these factors are aligned with what customers want and need and which results in higher sales. 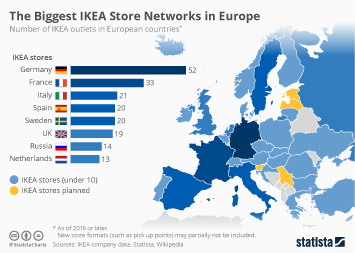 Without such extensive customer knowledge and best practices to benefit from that knowledge, IKEA would be unable to outcompete its current competitors. According to Millward Brown Optimor's "Brandz Top 100 Most Valuable Global Brands 2016", not only is IKEA the fifth most valuable retailer in the world, but it is also the the most valuable furniture retailer brand in the world, valued at over 18 billion U.S. dollars. The business operates 389 stores and is present in 47 countries. More than 780 million customers visit IKEA stores every year. Unlike IKEA’s largest competitors, the company has fairly diversified businesses. In addition to its furniture products, the company operates restaurants, houses and flats. Although, the firm’s main business is designing, manufacturing and selling furniture it is not so affected by the changing forces in this market as other furniture retailers.